Chill your soup bowls in the freezer. Pre-heat an outdoor grill or the broiler. Place the shrimp in a shallow dish. Puree the remaining shrimp ingredients in a blender or food processor; season with salt and pepper. Pour the marinade over the shrimp and toss together; let stand for 15 minutes. Broil or grill until cooked through, 6-7 minutes. Meanwhile, bring a medium size pot of water to a boil. Score the skins of the fresh tomatoes with an “X.” Place a bowl of ice water near the pot. Boil the tomatoes for 1 minute, then shock them in the ice water. Peel the tomatoes and add them to the food processor (or add the canned tomatoes if not using fresh), along with a small handful of the tortilla chips, the cucumber, roasted pepper(s), cubanelle pepper, Fresno chili pepper, onion, hot sauce, salt, to taste, and a drizzle of EVOO. Process to form a thick soup. 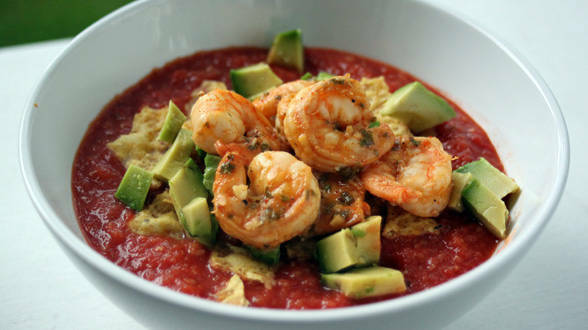 Serve the gazpacho in the chilled bowls and top with more chips, the avocado and shrimp. In Recipes-list.com we have selected the most viewed recipes from category - uncategorized . Enjoy the best recipes specially selected for you! Hot and Cold Gazpacho with Grilled Shrimp and Crushed Tortilla Chips is the right choice that will satisfy all your claims.